Explore the rich Wexford heritage that is present throughout Savannah's Historic District — the largest designated historic district in the United States. The sites on this walking tour are important landmarks that tell the stories of Wexford migrants as they arrived from southeast Ireland to make new lives in Savannah, Georgia during the mid-nineteenth century. Having experienced the tour, you will understand how the continued presence of Wexford in Savannah is felt to this day. Throughout the year, you can explore the nation's largest historic landmark district--Savannah is a pedestrian-friendly city that invites you to stroll along the park-like squares as you visit quaint cafes as well as gourmet restaurants. To plan your trip to Savannah, use the Visit Savannah portal. To see the rich heritage of this Savannah Irish story in Wexford, use the Visit Wexford site to plan your trip. Today, Savannah's bustling River Street is a place for shopping and entertainment, a purpose far removed from its original uses. Were you to travel back to the nineteenth century, you would experience it as the city's wharf district: a ship-crowded port whose dockside and warehouses were filled with a variety of products and people. Receiving such goods as coffee from Brasil and bananas from Cuba, the River Street zone exported huge quantities of cotton, rice, and timber. By any measure, it was an important player within the global economy! Beginning around 1845, businesses in Ireland started developing a presence in Savannah as a result of the initiative of Andrew Low, Savannah's then-leading businessman. Low engaged with three shipping companies from County Wexford in southeast Ireland, each of them eager to acquire Georgia timber for the Irish market. Initially, the Wexford vessels, such as the barque Dunbrody, moored alongside River Street with holds containing ballast, which got switched out for Ireland-bound lengths of oak and pine and also specialty wood products such as barrel staves. Towards the end of the 1840s, however, as Ireland's potato famine intensified, low-value ballast ceased to be the commodity brought from Wexford. Instead, the Wexford-to-Savannah portion of the voyage became an emigration pathway, with people from Wexford and its surrounding counties (particularly Wicklow, Carlow, and Kilkenny) stepping onto River Street to begin new lives in Savannah. Those individuals had much to offer to their adopted city, making theirs one of America's great migration stories. "Report and Manifest" (1 October 1824), Keith M Read Collection. Georgia Historical Society, Savannah. Walking down River Street you will always see and feel the bumpy large stones under your feet and wonder, what is this and why is it here? Well those large stones are called ballast, the weight used to keep vessels upright when no other product was on board, and that ballast has a story all its own. This stone was brought in by vessels from all over the world and from one place in particular, Wexford, Ireland, as seen in the below document from the port of New Ross in County Wexford: "Bound toSavannah (Ballast)." Little known to the Irish and their descendants in Savannah, and even less so to the visitors the walk upon it today, there is a little piece of the Irish homeland, and history, beneath their feet. "Port of Savannah declaration of goods" (1 January 1848), Graves Collection, BR 3/087. National Archives of Ireland, Dublin. “Port of Savannah declaration of goods” (1 January 1848), Graves Collection, BR 3/087. National Archives of Ireland, Dublin. In the mid-1800s Andrew Low created business connections with a Wexford shipping company, Graves and Son, based in New Ross, to institute the export of Georgia timber to Wexford. The document on the right lists three products, “Timber … Staves, and Rice.” This list shows products in contrast to what was typically associated with the Southern economy, cotton. The primary focus for trade travelling from Savannah to Wexford was on rice, timber, and specialty wood products, such as barrel staves and masts. Trade in the early years was one way with ships coming to Savannah from Wexford and then returning with goods from the American South. The question for shipping concerns became: How to make money on the trip to Savannah? After all, shipping ballast would not help to pay the bills. The solution? Passengers. Specifically, Wexford immigrants seeking a better life in America and who would pay for the journey across the Atlantic. That journey began in Wexford and took passengers past the Hook Lighthouse off the coast of Wexford, across the ocean, past various Atlantic islands, past the Tybee Lighthouse, and up the Savannah River to the bustling port city of Savannah. As they came off their ships they brought skills and knowledge that seemed to have made a very good first impression, similar to the "credible account of [their] demeanor" that Captain Rossiter noted in the article below. The (Savannah) Daily Republican (12 January 1859), p. 2. Before arrival on River Street, emigrants would have experienced a six week journey to Savannah. Those who departed New Ross, County Wexford would have sailed down the Barrow River before heading out to sea. At the mouth of the Barrow, stands Hook Lighthouse, the oldest working lighthouse in the world. It is very likely for most Wexford emigrants, Hook Lighthouse would have been their last sight of Ireland. Today, the Hook Peninsula offers some of the most scenic sights in Ireland. However, the story of the port did not just end for the Irish when they exited the vessels and made an initial impression; many found jobs a few feet from where they disemabrked. They were, in fact, so hard-working and active that a group of Irish immigrants founded the Workmen’s Benevolent Association, which sought to improve conditions for the dock workers. One of the key founding members was a Wexford man named Patrick Rossiter, and,according to historian Monica Hunt(1), this group advocated for higher wages, protection from unnecessary fees or exposure to any more danger than already required, and and increased safety through having ring buoys installed on the port. Hunt, Monica, “Organized Labor along Savannah’s Waterfront: Mutual Cooperation among Black and White Longshoremen”, 1865-1894. Formerly known as the Strand and then Irish Green, Emmet Park is surrounded by a collection of different stories explaining its history and past. This park was in fact named after Robert Emmet, an Irish Patriot known for his participation in the 1798 Irish Rebellion. However, Robert Emmet was never alive for the park’s naming and he did not donate the land to the city. Emmet Park has quite a long history and until recently, this history was unknown to the present day city of Savannah. Throughout the 1798 Irish Rebellion, the weapon of choice was the pike, which came to stand as a potent symbol. That was particularly true for County Wexford, where the fighting was most concentrated and bloody. In 1878, "an Irish lady" brought to Savannah a "pike ... used in the Irish rebellion of '98." The implement was put on public display in the city's annual Catholic Fair. At that time, the eightieth anniversary of the Rebellion was approaching, and increasingly songs and other means of commemorating it were emerging as later generations — both in Ireland and among the worldwide Irish diaspora — sought to honor a crucial episode in Ireland's history. The rebellion of 1798 affected Wexford more than any other county in Ireland. Several of the most noteworthy engagements occurred just outside of Enniscorthy making it one of the most attractive places to visit to learn about the legacy of 1798. Today, Enniscorthy and its region offers a variety of experiences to engage this story including the National 1798 Centre, Vinegar Hill, Oulart Hill, The Harrow, and the Father Murphy Centre in Boolavogue . Municipal Reports of the City of Savannah. (1904) p. 31, City of Savannah Research Library & Municipal Archives, Savannah, Georgia. In 1902 a lawsuit was made against the city of Savannah. William Low et al. vs The Mayor and Aldermen, or known as "The Emmet Park Case" was a battle for the land that made up Emmet Park. Those who owned land on the wharf believed that their property extended into the park and were attempting to claim this land for their use. However, on May 21, 1904 a settlement was reached by both sides that a road be built around the park for the land owners to use. From that day on Emmet Park was an official public park protected by the city. The road enclosing Emmet Park with Bay Street is now known as Rossiter Place. It was so named in 1983 after Frank Rossiter Sr., a prominent Irish-American figure in 20th-century Savannah and the grandson of a Wexford immigrant. He served Savannah as a city alderman and mayor pro-tem during the 1950s and 1960s, and because of these civic contributions, the city named the street around Emmet Park after him. Wexford immigrant William Kehoe rose to prominence as one of the most successful Savannahians of the late 1800s and early 1900s. Beginning as an apprentice, he moved up the corporate ladder and eventually obtained the title of owner of the Phoenix Iron Works, later rebranded as Kehoe Ironworks. Shortly after acquiring Phoenix Iron Works, Kehoe built his company into one that spanned most of his ward. 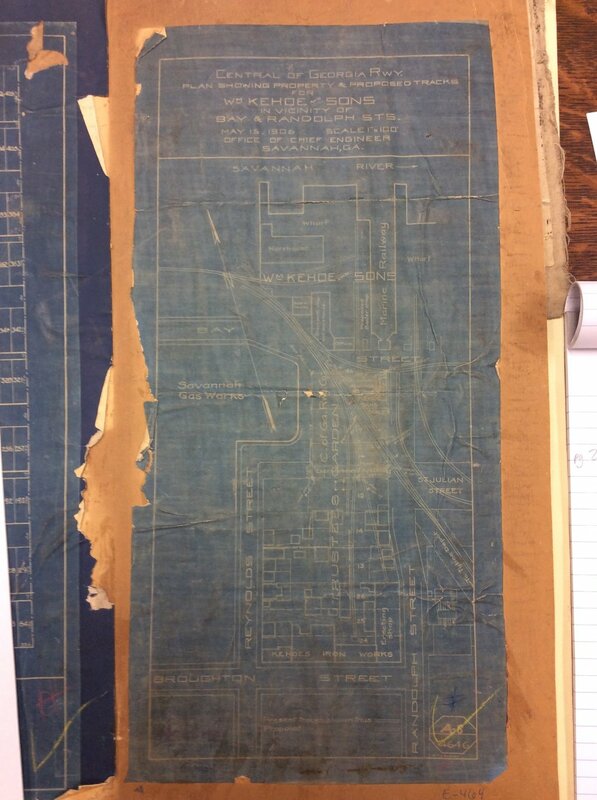 The railway from the top of this blueprint was introduced in 1905, and allowed Kehoe to bring ships from the Savannah river to be worked on in his shop. “Blueprint of Kehoe Iron Works.” (1906). East/West Maps, City of Savannah Municipal Archives and Research Library, Savannah, Georgia. In 1879, William Monahan left Kehoe half of Phoenix iron works, to be run in a partnership with his wife, Ellen. In 1883, Kehoe transitioned from being a co-owner of the factory to being its sole owner, but before purchasing the company, he first had to sell it under the partnership. Savannah Morning News. (2 November 1883) p. 4. One of Kehoe’s greater accomplishments is his contribution to the railway connecting the Savannah mainland to Tybee Island. Kehoe also incorporated a railway in his company. Connecting the Savannah River to his workshops, the Marine Railway allowed Kehoe to take ships from the river up to his shops for maintenence. In 1892, William Kehoe moved into an impressive, Queen Anne-style mansion, the design of which he commissioned from DeWitt Bruyn, a Savannah-born architect who had worked alongside the famed John S. Norris. Distinguished by iron columns, balustrades, and verandah-railings, the red-brick edifice cost $25,000. Its location, Columbia Square in the Old Fort district, is just a few blocks from Kehoe's Iron Works. Kehoe had earlier constructed a substantial Italianate residence on the same square. Kehoe's desire for grand homesteads likely derived from an awareness that his family had been tenant farmers in the northern part of County Wexford, Ireland. When the Kehoes emigrated from that county in 1851, the majority of Irish households rented farmland from large landholders, known as landlords. Typically, a landlord resided in a so-called Big House: a large country mansion, set amid parkland. Surviving examples of such estates open to the public in present-day County Wexford include Wells House and Johnstown Castle, the latter of which gives insights into Wexford and Irish farming, for it incorporates the Irish Agricultural Museum. One way of thinking about Kehoe's 1892 mansion is that it constitutes his Savannah version of an Irish Big House! Today, the gracious, red-brick Kehoe House is a deluxe bed-and-breakfast inn, rated on Trip Advisor (2017) as the #1 hotel in Savannah and #11 top romantic inn in the entire United States. The Town of Wexford was the departure point for the vessels owned by the firm of R. M. & R. Allen. In the early 1850s, families such as William Kehoe's could have secured passage on an Allen vessel at a variety of sites in Wexford, Eniscorthy or Gorey. After making their way from their home in Mounthoward in North Wexford, the Kehoes made their way to Trinity Wharf on the banks of the Slaney to board the barque Brothers and begin their journey to Savannah. Today, Wexford Town is well known as a vibrant center for the arts, anchored by the Wexford Festival Opera at the National Opera House. During the yellow fever epidemic of 1854, there were 650 deaths in Savannah, half of which were Irish immigrants. The death of the Diocese of Savannah’s first Bishop, Francis Garltand, was a blow to the brand new diocese, which was then without a leader during the catastrophic epidemic. Three years would pass before another Bishop, the Reverend John Barry, from Wexford, Ireland, would be named to the Diocese of Savannah. Like a true father to orphaned children, Bishop Barry healed the diocese after the yellow fever epidemic subsided. The fundamental foundation of Catholic faith had survived the epidemic, and upon it, he put the diocese back together, piece by piece, rebuilding the community. During this time, Barry played a large part in making the diocese what it is today. He put a lot of time and his own money into the Savannah community. After serving the Diocese of Savannah for several years, Bishop Barry fell ill and passed away in Paris. In his will, Barry donated his money to form an orphanage for the children of Savannah. He also gave money to numerous Catholic organizations in Savannah. During this time, another Wexfordian came along to take Bishop Barry’s place. Reverend Peter Whelan became the Diocese of Savannah’s administrator. He also shaped Catholicism in Savannah, but in a much different way. While they both embodied Irish determination and perseverance, Whelan is most known for going where others refused to go. He worked as a military chaplain at Andersonville, the largest and most infamous military prison for Union soldiers during the Civil War. Soldiers were moved into the camp before construction was finished, forced to live in homemade shanties made of blankets or sticks. The river that flowed through the camp did not supply fresh water for the prisoners, but rather carried disease and waste. Most priests avoided Andersonville or only stayed for short amounts of time, but Peter Whelan persisted through the entire fourteen months that Andersonville remained open. Nearly 13,000 soldiers died and, eventually, Whelan passed with them. He contracted a lung-illness while at Andersonville and died at 69 in 1871. His impact was so profound on Union soldiers that they mentioned Whelan in their journals and memoirs. Stories of Whelan’s selfless sacrifice spread throughout the country, far beyond Andersonville and Savannah. According to the Savannah Morning News, his funeral procession lasted four days, the longest in Savannah’s history. The love and respect people had for Whelan is yet another example of how Wexford shaped Savannah’s history. Like today, the Cathedral was the focal point of the Diocese of Savannah. The Irish in Savannah contributed their meager earnings and time to the Cathedral. In the records of pew purchases, we see influential Irish names like the O’Connor, Kehoe and Rossiter. These families, among many others, were a main part of the church community. In February 1898, soon after the struggles of epidemic and war, their beloved Cathedral, engulfed in flames, was destroyed by fire. This fire could have been a setback for the diocese, but parishioners immediately responded to rebuild this symbol of their community and their faith. The very night of the fire, even before the last flames were subdued, a group of parishioners, including Ireland native John Flannery, met at the Bishop’s house to discuss their plan of action. Cathedral of St. John the Baptist After the Fire (1898). Diocese of Savannah Archives, Savannah Georgia. They agreed to rebuild the Cathedral knowing it required extensive time and money. The Irish community was as determined as ever to rebuild their home where they could freely profess their Catholic faith. The persecution experienced under English rule in Ireland was not forgotten. Despite hardships in the new land, they understood the value of free religious expression. It fueled their desire to rebuild the Cathedral even grander than before. The reconstruction team raised money through donations from churches and organizations around the United States. John Flannery, the richest man in Savannah at the time, led the reconstruction. Finally finished two years later, the church was once again filled with signs of the Irish community that rebuilt it. It is likely that the neo-Gothic style of Savannah's Cathedral of St. John the Baptist was influenced by the style of churches in Wexford. Just prior to the migration event that brought hundreds of Wexford families to Savannah, the architect Augustus Pugin was designing churches throughout Southeastern Ireland including nine in Wexford alone. The seat of Wexford's Diocese of Ferns, St. Aidan's Cathedral, was designed by Pugin and was completed in 1843. Today, visitors to Wexford can visit the Pugin Trail to see these awe-inspiring churches. Built in 1849 on a plot in Lafayette Square, Andrew Low’s house was one of the largest homes to be built in the Savannah area. The time that Low’s house was built is crucial to our story; it was built in the midst of his dealings with Graves & Sons based in Wexford, and when hundreds of Irish emigrants traveled to Savannah through their business connection. This modern-day photo demonstrates its intricate design and charming garden. "Invoice from Andrew Low to Graves and Sons," (8 February 1847), Graves Collection, BR 3/087. National Archives of Ireland, Dublin. Arriving from Scotland in the early 1800s from humble beginnings, Andrew Low II became the largest cotton facilitator in Savannah. He established business connections with Graves & Son, a shipping company based in New Ross, County Wexford, Ireland, and began to ship lumber and rice. 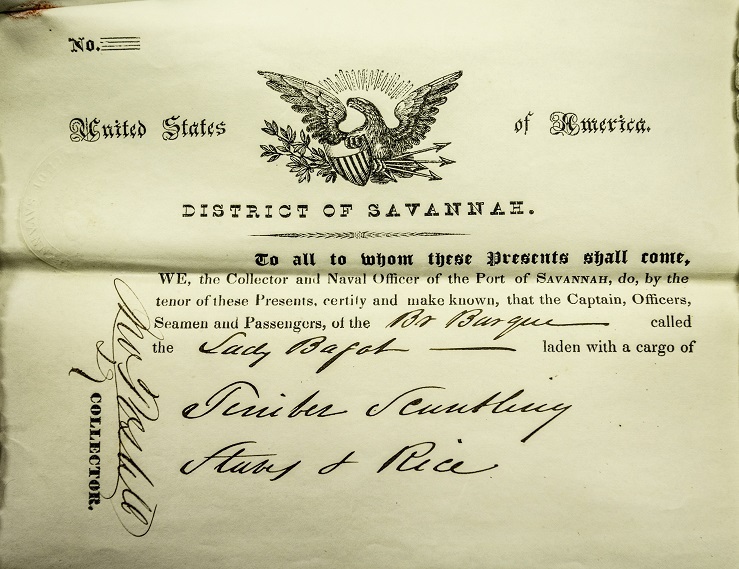 This international business relation opened the door of Savannah to hundreds of Irishmen that were emigrating to the United States, and shaped Savannah’s culture into what it is today. Established in the late 1840s, Andrew Low and Co. and Graves & Sons decided to conduct business with one another and send various goods, like timber, to Liverpool or other nearby locations. During this time, Liverpool was one of the largest centers for international trade. This invoice for Graves & Sons from Andrew Low for a shipment of different types of timber serves as documentation for their extensive business that they conducted. After shipping the goods to Liverpool or Wexford, the ships, now empty, would need something to fill it in order for its safe return to Savannah. The Dunbrody was the first barque to transport emigrants to Savannah after goods were delivered in Wexford, Ireland. Today, visitors to New Ross, County Wexford can tour a full-scale replica of the Dunbrody and learn about its voyages to Savannah and beyond. Savannah Daily Republican, (4 May1847), p. 2. Andrew Low did not only provide passage for the people of Ireland; he provided assistance in other ways. In 1847, an article from the Savannah Daily Republican was published that entailed Andrew Low’s benevolent contribution to the Irish Relief Fund, which benefited people of Ireland as well as his home country Scotland. As the year 1847 is commonly referred to as “The Black ‘47” by Irishmen because the severity of the famine was at its worse during this year, we must commend Andrew Low for his contribution to help these suffering people. Just a short year after forming a business relation with Graves & Son, Andrew Low sent a generous amount of corn, rice, and flour that totalled an amount of approximately $360,000 of today’s money. This act of kindness reveals Low’s benevolence and that he did not forget his humble beginnings in Scotland when he made his fortune in Savannah. He acted not only as a business leader in the city, but as a moral leader as well. A Unique Migration and Integration Story. Connecting a Shared Heritage to the Present.